Challenging Conditions, Fantastic Times! North 1,2,3*,5!!!!!! 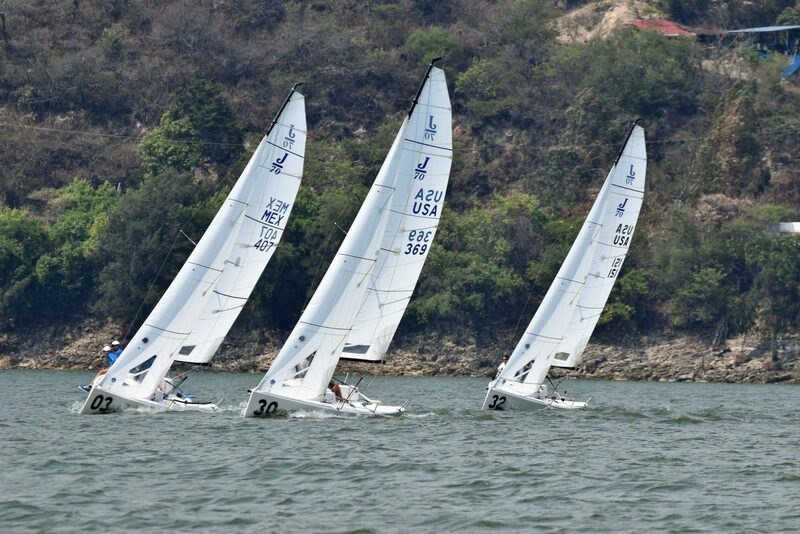 Sailing on a lake at nearly 6,000 feet of elevation in the middle of Mexico is not the normal kind of venue that comes to mind when racing a J/70 North American Championship. However, the location, the weather, the sailing, and the people in Valle de Bravo were all top notch. Valle provided picturesque scenery with days reminiscent of the movie Ground Hog Day. In the mornings the temperature was cool and the wind was completely absent. As the day went on and the heat built, the thermal breeze would arrive like clockwork around noon, and the glassy lake would instantly be filled with a shifty and puffy 8-14 knot breeze. The breeze often arrived so quickly and seemingly out of nowhere that it could easily catch you off guard. The pressure and angle variances in the wind across the course made the sailing quite interesting and even comical at times. It was not uncommon to see boats sailing upwind on opposite tacks with nearly the same heading, mearly boatlengths apart. This made my job as tactician tough, to say the least! Patience paid huge dividends and it was important to remember that sometimes when you might look the worst in a given moment, you could quickly go from zero to hero in the next shift, which was usually just moments away. It was also crucial to keep your head out of the boat, as there didn’t seem to be much rhyme or reason to the puffs and shifts. Being proactive with your crew weight and gear changes through the pressure changes were also key elements to the puzzle. Downwind in the flat water provided excellent conditions for very fast wing-on-wing sailing. The trick here was to make sure you had enough pressure in the spinnaker to switch to the wing. Good communication from the spinnaker trimmer to the driver was essential and we also found that you want the boat to be going around 5.8 knots before deciding to wing. Teams also experimented with transitioning to the wing by jibing the boom, but also by jibing the kite. In the past, most teams have primarily been jibing the boom, but if pulled off correctly, jibing the spinnaker seemed to work a little bit better as you don’t have to swing the mainsail through the air which can throw some turbulent air in the direction of the spinnaker at a time when it is the least stable. Javier Navarro led his team on Bandoola (powered by North Sails jib and spinnaker) to a solid third place finish with Ander Belausteguigoitia (and I thought my last name was hard to pronounce!) on the helm and Javier Patron and Maria Jose Porter crewing. This team also shined in the Mexican Nationals just days before where they won the event with style even though the breeze was influenced by thunderstorms, causing it to switch 180 degrees, twice in each day. Oivind Lorentzen, with Mike Buckley calling tactics along with Jeff Reynolds and George Peet crewing, took second place with all North Sails. The J70 2018 North American Champions won the event going away and didn’t even need to sail the final race (quite the accomplishment given the tempermental wind conditions). Congratulations to Thom Bowen and his team Reach Around with Bill Hardesty calling tactics, Alec Anderson and Jacolyn Wetmore crewing. Reach Around was also powered by full North Sails inventory. Erik Brockman, sailing on Vincitore with Ricardo Brockman skippering to a commendable 8th place finish, organized a remote control Laser racing tournament that was a blast for both the racers and the spectators (thanks again, Chip Till, for calling me over – twice!). Special thanks go out to Sean and Tanya O’Keefe for setting us up with their J70 Mexigenics and also Kenneth Porter for hosting Chris Snow and myself at his house and for sailing with us along with Danny Banos on Mexigenics. All in all, if you ever get the chance to sail a regatta in Valle de Bravo, jump on it! This place is definitely one to add to your bucket list. I know I personally can’t wait to get back down there.